Today’s post comes from guest author Sue Logan, R.N. At any age, home is the best place to be. If you’ve decided that staying at home is a much better option for yourself or a senior family member than the nursing home or an assisted living facility, you’ve made an increasingly popular choice. In the year 2013 alone, over 4.9 million United States residents received home care! Before talking about how to pay for services, let’s look at the different types of care provided. This can help clear up any confusion about why Medicare paid for Mr. Bill’s home health aides, but Mrs. Jones’ services were not covered under her Medicare benefits. Home health aides provide skilled health services that may include tasks like checking a patient’s blood pressure, pulse, and respirations. They may assist with braces or other medical equipment or may help a patient with post-surgical exercises, in addition to basic personal care tasks. These activities are medical in nature and are performed under the supervision of a licensed professional, such as a Registered Nurse or Physical Therapist. Since the care provided in this case is deemed “medically necessary” by Medicare, it’s typically at least partially covered. However, to qualify for Medicare benefits for home health care, you must meet strict guidelines. Home health aide visits are usually brief and patients are often discharged from Medicare-funded home health care within 4 to 6 weeks of admission. Medicare also limits the patient to no more than 100 days of home healthcare per year. Non-medical home care aides, however, assist persons with activities such as getting dressed, bathing, light housekeeping, meal preparation, shopping, transportation, or may simply provide companionship and supervision. Being non-medical care in nature, these services are not covered by Medicare. To qualify for IHSS, you must have a Medi-Cal eligibility determination and must reside at home or at a residence of your own choosing. A Health Care Certification form must also be submitted to your local county IHSS Office. A social worker will visit you in your home and assess your need for services and the types of care that may benefit you, as well as your eligibility for services. Based on the social worker’s assessment and information obtained from your physician and other healthcare professionals (if needed), you will be notified if your request for IHSS has been approved and how many hours per month of care have been authorized. United States Veterans and their survivors who are eligible for a pension from the Veteran’s Administration (VA pension) may qualify for financial assistance which could be used to help pay for home care. Two different programs are available for veterans, both of which increase the monthly VA pension amount (note: a veteran or a survivor cannot receive benefits from both of these programs at the same time): Veteran’s Aid & Attendance and Housebound. • Aid & Attendance: An A&A allowance increases the monthly VA pension amount, provided you need the help of someone else to complete usual tasks of daily life, such as dressing, bathing, eating, meeting toileting needs, or for supervision to ensure your safety at home. • Housebound: This program is similar to A&A, but to qualify for the increase in VA benefits, you must be largely confined to your home due to a permanent disabling condition. To apply for either Housebound or Aid & Attendance, visit your local Veteran’s Administration office or contact the Pension Management Center that serves your state. Another way for veterans to help pay for home care that does not render them ineligible for Aid & Attendance or Housebound benefits is the Veteran-Directed Home and Community Based Services program, or VD-HCBS. This program is sometimes referred to as Cash and Counseling for Veterans, Veteran Directed Home Services, or the Veterans Community Living Program. The VD-HCBS program allows veterans to receive care at home, under their own direction, provided by the caregivers of their choice and provides them with a budget to pay for the services, rather than receiving nursing home care from the VA’s healthcare system. Under this program, the participating veteran manages his or her own care, hiring and scheduling caregivers and supplies according to a plan of care that has been approved by the VA. Since the VA has previously approved the care plan, the spending budget has been established, and payment for care received is made by the administrating agency after being authorized by both the VA and the veteran. The VD-HCBS program is open to all US Veterans who require an intermediate nursing facility level of care and are enrolled in the VA’s healthcare network. A specific type of reverse mortgage, the Home Equity Conversion Mortgage, or HECM, may be a viable way to pay for home care if you or your spouse is not a veteran and you are not eligible for Medi-Cal. This type of mortgage can only be obtained via an approved Federal Housing Administration (FHA) lender and is insured by the United States Federal Government. You must be at least 62 years old to qualify for a reverse mortgage. Using this funding source to pay for home care involves obtaining a loan against your home’s equity. The lender then makes payments to you in one of several ways – in monthly installments, as a line of credit, or in a single lump sum. The loan does not come due until the borrower no longer lives in the home for a full year or passes away. In addition, there are no restrictions on how you spend the money obtained through a reverse mortgage, and you are allowed to borrow up to 70% of the value of your home. A significant advantage to using reverse mortgage payments to fund home care is that the money you spend on care does not count as income when used in the same month it is received. However, reverse mortgages should not be taken lightly. While it may seem like an easy source of income, the very nature of a reverse mortgage assumes the borrower will not move from their home. In addition, when the homeowner/borrower passes away, they will not be able to pass their home onto their heirs unless the heirs are able to purchase the home back from the lender. You may not have a lot of personal savings or monthly income to pay for home care services, but financial resources may be available to you in the value of your home. A Home Equity Line of Credit may help you obtain cash more quickly than a reverse mortgage. These funds can then help you or your loved one pay for home care and remain living independently. Similar to a credit card, but with lower interest rates, a HELOC is a loan. If you choose to use a Home Equity Line of Credit to finance home care, you will be told how much total money you can borrow and then are allowed to withdraw money on an as-needed basis, up to the maximum allowed amount. A HELOC is awarded for a determined time period, from 5 to 25 years and is secured by your home. When the loan comes due, the loan is paid back in a lump sum, with interest, typically by selling the house. A word of caution about HELOC loans: lenders can freeze these loans with little to no warning, and failure to repay may result in foreclosure. You must also factor in the loan’s interest rate, which typically ranges from 3.5% to 6% or more, and determines whether the final pricetag of the HELOC makes it a blessing or a burden. Unlike lines of credit and reverse mortgages, there are no interest charges associated with a REX agreement. This is a contract in which a portion of the equity in your home is exchanged for a lump sum of cash. The company, called FirstREX, shares in your home’s appreciation, but also shares the risk if your home loses value over the life of the contract. If you need help to cover the cost of home care and are considering a REX agreement, you and FirstREX will first determine your home’s worth through an independent appraisal. Consider the amount of cash you need to pay for home care when deciding how much of your home’s appreciation you want to share with FirstREX. Under a REX agreement, you are required to reside in your home for the entire life of the contract. The agreement can last for up to 30 years and most often these contracts end when the home is sold. If you sell your house within the first five years of initiation of a REX agreement, you will be penalized in the form of an Early Termination Adjustment fee. Here’s an example: say your home is worth $400,000 and you receive a $40,000 lump sum in exchange for 50% of the home’s future change in value. If you sell the home for $450,000, you would owe FirstREX $65,000 (the original $40,000 plus $25,000). On the other hand, if you sell the home for $350,000, you would only owe $15,000 ($40,000 minus $25,000). Under California’s Paid Family Leave program, if you need to take time off from work to care for a seriously ill individual, you can receive compensation for providing care for up to six weeks per 12-month period in an amount up to 55% of your current income. However, there are no guarantees your job will be held for you. Be careful not to confuse this program with the Family and Medical Leave Act, which provides eligible workers with unpaid leave and the guarantee of their same or an equivalent job when they return within 12 weeks. If your family member requires care to remain safely at home, you may be able to provide some, but not all of their care. In this case, when you provide a portion of the care, you can be paid by California’s Paid Family Leave (PFL) program and use those earnings to pay for other home care services like housekeeping, shopping, or to provide overnight care while you sleep. The amount of benefits you receive per week is based on your highest quarterly earnings during the previous 12 months. Long-term care insurance is sometimes referred to as nursing home insurance, but in many cases, it will also pay for home care, depending on the type of policy purchased. The price of monthly premiums varies greatly and can range from around $300 to over $1000 per month. If you need home care right away and you don’t already have long-term care insurance, this method of helping you pay for care is not an option. Typically, insurers will not accept new enrollees if they are frail or are in need of immediate assistance. If you are accepted, your premiums will be extremely expensive. If you or your loved one have long-term care insurance, check to see if the policy covers home care. Depending on how you or your family files your taxes, there may be Federal tax deductions and credits available to you. If you are able to claim your loved one as a dependent on your income tax return, you may be able to receive further credits. 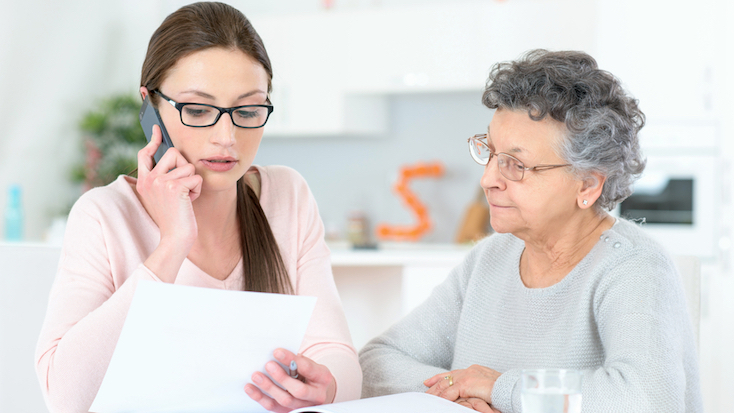 While tax credits and deductions are generally not a source of ready cash to pay for home care, they can amount to substantial savings you can keep and apply to keeping mom or dad at home. In addition to Federal tax deductions for medical and dental expenses, in California, the Child and Dependent Care Tax Credit can be worth up to 35% of the Federal tax credit. When thinking about home care, it’s important to consider the needs of the person who requires help. Do they have complex medical needs? Is it essential they have the assistance of a home health aide, or can their needs be met by a home care aide? It’s not uncommon for home health aide services provided by a home health agency to cost significantly more than care provided by non-medical home care aides. On the other hand, you may be able to find caregivers without the assistance and support of an agency. This is typically the least expensive way to hire caregivers, but also involves the most personal risk and legal liability. Be sure to carefully screen anyone you allow into your home and perform thorough background checks to ensure the safety of those you love. Another disadvantage to hiring outside of an agency is that if your privately hired caregiver becomes ill, has a family emergency, or car trouble, you may be left without care with no advanced notice. Working with an agency can help ensure you have a team working on keeping you covered. HomeHero is one of the most-trusted home care agencies in California. As a fully licensed home care organization, we thoroughly vet all our home care aides through background checks, competency tests, and medical screenings. To learn more about how we can help you or your loved one remain at home or to receive a free consultation, click here. Note: Note: The information in this article is for informational purposes only. If you have questions regarding your personal finances, consult an elder law attorney or certified public accountant.